Welcome to The New Stack Context, a weekly podcast where we discuss the hottest news and views in the scalable IT community. For this week’s episode, we’re speaking with Emily Freeman, a software engineer and cloud advocate at Microsoft, about the role of developer relations in developer marketing. Freeman wrote on her personal blog late last year about the role of developer relations, otherwise known as devrel, in software engineering. Developer relations roles have become more popular at large enterprises and the major cloud providers. We recently noticed Amazon Web Services advertising a raft of new developer relations openings focused on serverless and the Azure team alone has 15 advocate roles open. But the position has taken a bit of heat, of late, among a vocal group of Twitter critics. So Emily is here to help clarify what devrel is all about and why you might just want to thank the next one you see. In the second half of the show, we’ll review our top stories for the week, including Mary Branscombe’s article this week on HTTP/3. When HTTP, the hypertext transfer protocol, was invented, the needs were pretty clear — to ship web pages quickly and reliably from servers to end clients, which back in the early 1990s, was always a home computer. As the web grew and spread onto other platforms, such as mobile devices, and took on new formats, such as streaming video, the packet-switching technology started to hit its limits. In 2016, we got first word of an update, HTTP/2, which was based on the Google SPDY protocol. The updated version promised faster page load for high latency environments, better responsiveness, and a higher security and privacy bar. HTTP/3 furthers this efficiency, and it includes TLS 1.3 and a new transport protocol called QUIC (Quick UDP Internet Connection). The New Stack editorial director Libby Clark hosted this episode. She is joined by Ben Ball, TNS director of marketing Ben Ball, and TNS managing editor Joab Jackson. HTTP/3 Replaces TCP with UDP to Boost Network Speed, Reliability: The next major version of HTTP moves away from TCP for speed and security but it won’t be in use for some time, reports Mary Branscombe. Airflow, a Workflow Orchestrator for Big Data: A project that came from AirBnB, Apache Airflow is quickly becoming the de facto standard for workflow orchestration. Workflows are defined as code, making them more maintainable, versionable, testable, and collaborative. Bringing DevOps to the Full Stack at Colonial Life: Benefits provider Colonial Life Agile moved their operations to CI/CD-drive DevOps tools and practices, allowing them to triple the number of builds and do an order of magnitude more deployments. Quali: From Infrastructure-as-Code to Environments-as-a-Service: With Cloudshell Colony, released this week in a limited, controlled availability, cloud sandbox vendor Quali wants to make it so that anyone, from IT and project managers to developers and DevOps teams, can govern the use of cloud resources from a single pane of glass. 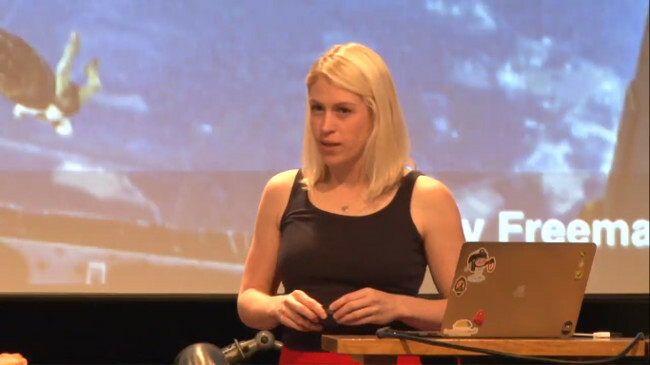 Feature image: Emily Freeman at DevOpsDays 2018.